John Idan is the lead vocalist and guitarist of The Yardbirds. John can also be seen with his bands The John Idan Group, The Natural Blues Band or Ric Lee's Natural Born Swingers . UK Dates announced - see 'gigs' page! Detroit born John Idan joined The Top Topham - Jim McCarty Band following a holiday in London in 1988 (-1992). He later became known as The Yardbirds lead vocalist and bassist (1994-2009), recording albums "Birdland" (2003) and "Live at B.B. King's" (2006). 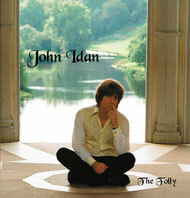 He left the band in 2009, following the release of his solo album "The Folly" and founded The John Idan Group playing a broader blend of music. In 2014 he revived his highschool band "The Natural Blues Band", returning to his 'Blues roots'. In 2015 John Idan returned to The Yardbirds on guitar and lead vocals. Finally my website is back on track with new and older information as well as a new domain. In the next day's and weeks I will ad more bits and bobs to the separate pages - so keep checking. If you want, please feel free to tell us your thoughts in the guestbook or sign up to the newsletter list. The Folly - soon available on the Shop page! Andrew Loog Oldham talks about John Idan - see 'Reviews' page!